A slightly recessed quarter round to a corner of a larger piece. A collection of a few mouldings that are seen often. Quarter rounds are always known as quads or quods and they have thank goodness been replaced by neater ways of finishing an internal corner. 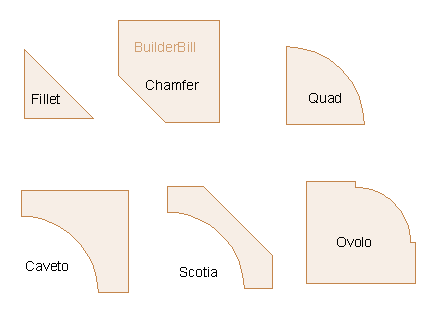 Ovalo is a standard term and cavetto is used when the quarter hollow shape appears as part of a larger moulding. When standing alone it is mostly referred to it as a scotia. All of the previous is UK English trade terminology and the American English words of course have developed separately though they refer to the same basic shapes. Quirks are only small things but they would be impossible for joiners and joinery and furniture manufacturers to do without. Imagine fitting a joint like shown on the left. It leaves absolutely no margin for error. The quirk gives a visual guide and a positive guide for tools. 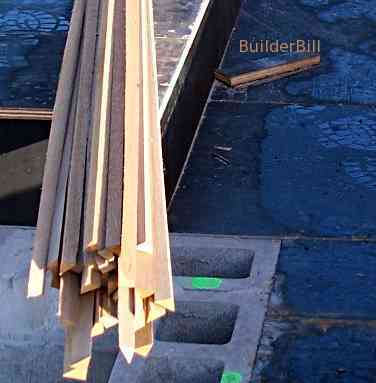 This bundle of fillet mouldings are about to be placed in the corners of beam forms. When the concrete has been poured and the formwork stripped the the exact opposite of the fillet shape, a chamfer will be seen on the beam edges. The term fillet can is applied to beads of mastic or silicone that is run along an inside right angle corner. Another example is glazing windows with putty pointing fillets. Above is a decent sized chamfer to an edge. This method of terminating it back to square is very common as it makes the joining of the board or in this case the trimming of the board with quads very easy. 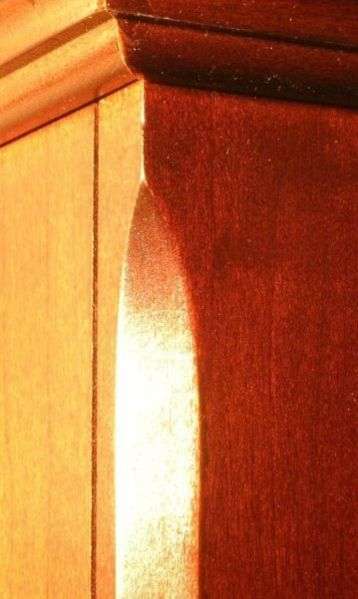 To finish a fillet like this with a chisel is sometimes known as a "Lark's Tongue". More often than not it is terminated in a curve that is the diameter of the cutter head that makes the chamfer.